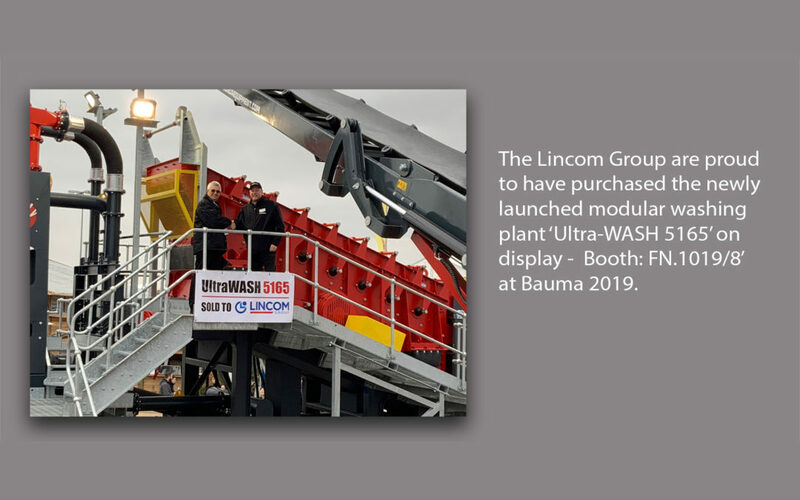 The Lincom Group are proud to have purchased the newly launched modular washing plant ‘Ultra-WASH 5165’ on display – Booth: FN.1019/8’ at Bauma 2019. Currently available in three sizes, the UltraWASH can produce up to three aggregate products and two sand products. The McLanahan Modular Wash Plants are assembled from containerized washing modules and produce up to five different products, including three clean aggregate and two washed sand fractions. The modules are quick to set up and easy to assemble, so you can begin production almost immediately. Pictured: Peter Godwin ‘Environment & Process Manager. Lincom Group’ alongside Neil Treseder ‘Aggregate Systems Regional Sales Manager – APAC Region’ at McLanahan Corporation’. Lincom Group offer modular solutions including the UltraWASH, UltraSAND, and UltraFines product range to the Australian and Papua New Guinea markets.